The New York Yankees sent starter Michael Pineda to the 15 day disabled list after suffering a strain in a muscle in his back. Pineda said his right lat muscle suddenly felt tight after a pitch in the first inning of the simulated game he pitched Tuesday in Florida and an MRI confirmed it. Pineda was et to come off suspension for using pine tar in a game against Boston, but the injury looks like it may force Pineda to miss 3-4 weeks. Reliever David Phelps will replace Pineda in a rotation that has already lost Ivan Nova for the season due to Tommy John surgery. 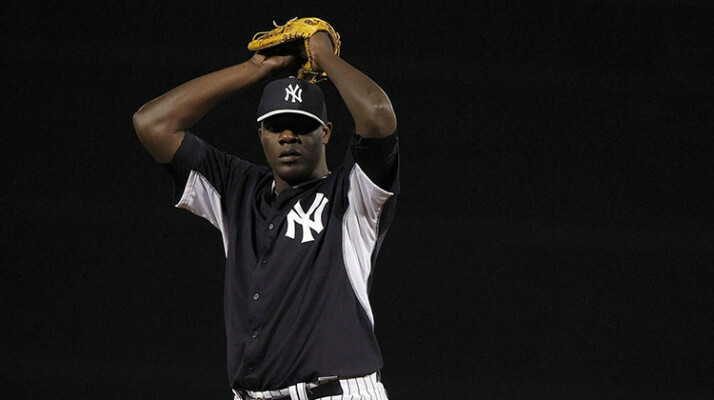 Pineda said he wasn’t exactly sure when he’d return. “I don’t know,” he said. “I do not assume.”And though he’s disappointed, he said, he’s been through worse. “I’m coming back soon,” he said. The Yankees also announced that infielder Brendan Ryan was activate from the DL. Ryan began the season on the DL with a pinched nerve in his back, but he had no issues during his recent rehab assignment. Ryan could see more playing time than your average backup shortstop playing behind Derek Jeter, who figures to need regular rest as the season moves along.